A few days after I delivered my firstborn, my mother in law kindly prodded me as to when she could prepare some chicken soup for me. In my husband’s culture “Sopa de Gaunita” or hen soup as it is translated is given to honor and nourish a new mother after her delivery. I told my mother in law I would be happy to have the soup whenever she had the time to prepare it. I will never ever forger her response. “Okay good! Just give me some time because I have to catch the hen.” Suddenly my feeling of being a “culturally knowable” woman fell away. HA! In my Anglo Saxon upbringing I had never heard of such a thing. Growing up, chicken soup came from a can or was made with premade stock, so talk about a little culture shock. I felt guilty that this poor hen would get butchered for my sole benefit. So after weighing my conscious I asked my dear husband to kindly thank his mother but refuse the soup. Bad move. Not only was I unable to reap the benefits of this amazing form of nourishment but I also had unintentionally disrespected my mother in law by refusing something that is a very special form of showing respect and honor to a new mother. Very often in my husband’s culture it is the new mom’s mother who makes this soup for her. So this was indeed an act of many symbolic meanings. This experience was a huge lesson for me. We can dig in our heels and deny it till the sun goes down but no matter how easy or difficult it is to admit, there’s a wealth of wisdom that our mothers have passed down to us. When she told us that chicken soup was the best medicine for most of our ailments you better believe that she was not far off. On a side note upon the arrival of my second born I did receive a most delicious and unctuous bowl of “Sopa de gaunita” and I have no regrets whatsoever! Bone broth has been named a “prehistori paleo drink” by many, and its increasing reputation and popularity has filtered into the social consciousness of the birth world of late. In almost every culture some form of bone broth has been traditionally used to nourish our postpartum mothers. If you look, evolutionary, the chicken soup that was indoctrinated into our American culture has roots that date back to our own hereditary lineages. The sad fact is that the evolution of bone broth has been diminished to what we pour out of a can of Campbell’s. So what is bone broth? And why is it significantly beneficial more than soups, stocks, or simple broths? The differences between these three are very small, minuscule even to some, but very important when it comes to understanding and reaping the benefits for your postpartum body. · Broth is typically made with meat and a small amount of bone. The ratio of meat to bone is much higher. The cooking process for broth is around 45 minutes to 2 hours, the consistency of the broth in thin and watery and the flavor is very light. This broth has a good source of protein. · Stock is made with the ratios of broth only reversed. This means that there is more bone and very little meat. Think of the sinews or muscular tissue that clings to the bones. Usually the bones are roasted before they cook in the stock for 3-4 hours. This broth has a good source of gelatin. 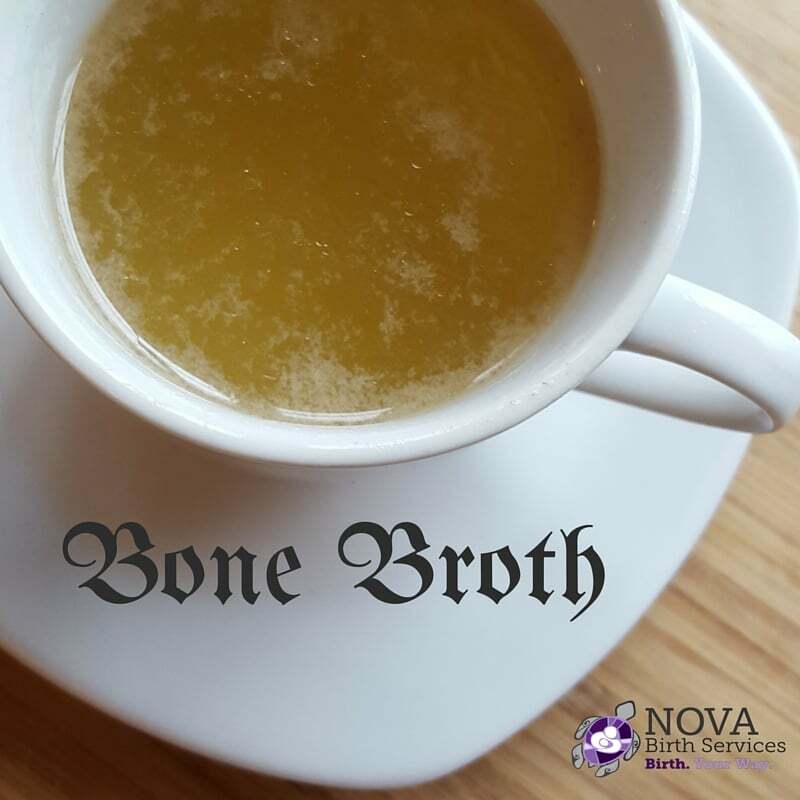 · Bone broth like stock, bone broth contains more bone than meat. Vinegar is often used before cooking to draw out the minerals and infused them into the broth. Bone broth is cooked the longest with a minimum of 24 hours. This broth is rich in gelatin, protein, and minerals which is what makes it the trifecta of both stock and broth. After labor your body is at its most vulnerable. It needs the time and resources to properly heal and recover from the incredible journey of pregnancy and birth. o Calcium & Magnesium: allow muscle contraction and relaxation (which is needed for your organs to return to their original size and position) assists in clotting and tissue repair, and supports normal nerve functioning and endocrine balance. o Phosphorus: generates energy and regulates intercellular pressure which prevents weakness and fatigue. o Potassium: supports electrolyte functioning and assists with muscle contraction and relaxation. Enjoy this recipe of bone broth and to download and print for your recipe box, click the button below! Enjoy! Directions: Place your ox tails in a slow cooker and cover them with enough water to cover the bones. Only let the water come 1 inch above the bones so the broth with be concentrated. Add your vinegar to the slow cooker and let it sit for 1 hour. After one hour turn your slow cooker on low and add the vegetables. Cook for 24 hours and then strain the contents of the broth and season with salt. Store in refrigerator or freezer and enjoy!